If you work for a software company, your clients will request new features every day. This is a good thing, because user feedback is critical to developing applications that not only work, but work in ways that meet the real-life needs of your client base. That’s why, when a client asks for a new button, switch, or lever, we need to consider the underlying benefit they’re after. What are they really asking for? A client of ours recently asked if we’d add a “Refer a friend” button to the signature line of emails we send on their behalf. They’d seen it elsewhere and thought it would be a good way of encouraging people to send them the names of people interested in buying insurance. This is what we in software call a “feel good button”—a feature that makes users feel better when having it, but that adds little value in practice. Our client was looking for another way to make more sales and believed that having a clickable button inside their email would accomplish this. There was just one problem: People don’t randomly click on buttons and provide the names of their friends and family. That’s not to say referrals aren’t made in this industry; quite the contrary. People refer to insurance agents quite frequently; they just don’t do so by spontaneously filling out web forms with the names of people that may (or may not) be in need of a new or better policy. All things considered, this particular feature request isn’t unreasonable. It’s logical to assume that there’s no harm in asking for a referral. After all, you miss 100% of the shots you don’t take—just ask Wayne Gretzky. The problem is, though, that you may be taking the wrong shots; at best you’ll get a lukewarm lead and, worst, you could annoy or even alienate customers and prospects. Now, you’re probably already counting the reasons that this approach is wrong, but, most important, this rationale signals a fundamental misunderstanding of how referrals are made in the insurance industry. Moreover, it reinforces the idea that referrals are simply names of warm leads an agent can call on and close with ease. In reality (and in 2017), a referral can take many different forms: a testimonial, online review, social share, an inbound call, word-of-mouth, you name it. In order for a referral strategy to work, insurance agents need to think about the paradigm shift in how people are communicating today. Really think about it. Need I say that the Internet and smartphones have changed everything? They’ve thrown a proverbial wrench into the (literal) referral handbook of years past. Twenty years ago, people were introduced to agents by old-fashioned marketing—radio, billboards, Yellow Pages, carrier pigeon, that type of thing. Or, more likely, they were referred by someone close to them. As with today, successful insurance agencies benefited from positive word of mouth. But prior to the Internet, consumers had access to only a small network of friends and family to lean on for recommendations. Today, people have instant access to hundreds of crowd-sourced reviews and testimonials. Looking for home insurance? Just Google it. How many stars do they have? What are people saying about them? You could be the best agent ever, but if you’re absent online, many people will never know it. Encouraging clients to write online reviews or share testimonials on social media would help get the word out much more than an uncomfortable referral request. Besides, people love giving their advice. It appeals to their ego and you’ll be able to get them to do it while their great experience is fresh in their mind. Another reason that asking for referrals rarely works is that the timing is off. An insurance policy isn’t like a cool new product your buddies need to check out (even if you vehemently disagree). It’s insurance. Everyone knows it exists, and any suitable lead already has it. So even though an agent is the bee’s knees, it’s just not something people are usually talking about unless the subject comes up. What’s more, people are unlikely to know how satisfied their friends are with their current insurance provider at any particular point in time; it’s hardly water cooler gossip, as much as we might like it to be. Not to mention that people are uncomfortable with giving out the names of people close to them so that they can be sold to. They will, however, refer their agent if the timing and situation calls for it. When settling on a referral strategy, an agent should consider how people come to need and search for an insurance provider. They want to be present during each stage of the buying decision-making process to increase the chances that they are discovered when the time is right. These stages include: need recognition, information search, evaluation, and purchase/post-purchase evaluation. Need recognition—Agents should wow their clients and encourage them to refer their friends and family when the time is right—thus creating an opportunity for introductions that otherwise would not have been made if existing clients were not encouraged to do so. Information search—Actively collect and post online reviews that effectively improve local SEO and increase the likelihood that they are discovered by prospects searching for insurance. This could be as simple as sending a recently delighted client a link to your Facebook page. Evaluation—After an agency is discovered online (with the help of online reviews), prospects will evaluate their options. This is why having a solid website is important. 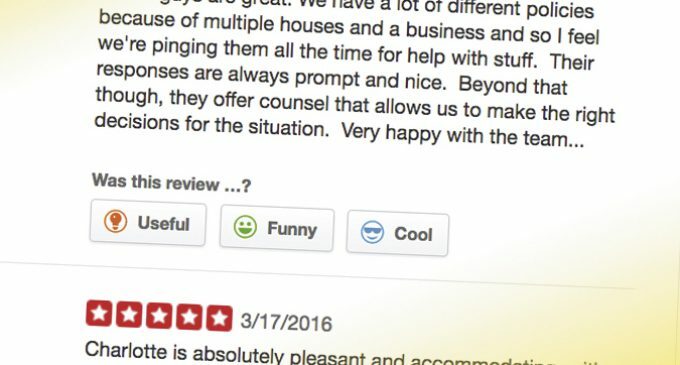 It should be modern, easy to navigate, and include client testimonials to increase the perceived value and reputation of the agency and its services. Purchase/post-purchase evaluation—Reach out to existing clients regularly with meaningful communication to maintain relationships, encourage feedback, establish a referral mindset, and refer future prospects in need of insurance. Grady attributes his referrals to his meeting three main objectives. First, he aims to win the trust of his clients and prospects alike. Second, he wants to offer comprehensive insurance products that actually meet the clients’ needs. Finally, and perhaps most important, he wants to show that he actually cares about his clients by treating them the way he’d expect to be treated. The Golden Rule, no less. When you look at it from all sides, having success with word of mouth is, first, about creating an experience for clients that is worthy of earning referrals, and then making it as simple as possible for them to do so—where and when it makes sense. Carl Maerz is the co-founder of Rocket Referrals, an automated communication strategy that helps agencies improve their referrals, retention, reviews and relationships. He aims to help local agencies leverage their advantages over direct carriers by replacing common industrial myths with relevant and practical advice. Contact Carl at carl@rocketreferrals.com.